Nestled away below the Glencoe Mountain Range, amongst arguably some of the most picturesque landscapes in Scotland, lie the small towns of Dunkeld and Birnam. Situated 15 miles North of Perth, and a short drive from the quaint town of Pitlochry, it hugs the banks of the River Tay and is the perfect place to stay if you want to explore this beautiful part of Scotland. We stayed in Jessie Mac’s, a luxury ‘eco-hostel’ that is actually in the town of Birnam (on the other side of the River Tay from Dunkeld). It’s a 5 minute walk from most of the pubs, shops and restaurants in Dunkeld and is certainly the most welcoming hostel I’ve ever stayed in. Dot and Brenda were excellent hosts, with breakfast included in the price of the accommodation. The Taybank, a pub previously owned by Scottish musician Dougie Maclean, is a must if you are visiting this area. It’s the quintessential Scottish pub – a rustic decor with thick wooden tables, plenty of whiskey and of course live folk music. We went here on both nights of our stay because the atmosphere was so good. There are lots of small independent shops around Dunkeld, with many of them stocking locally produced products. 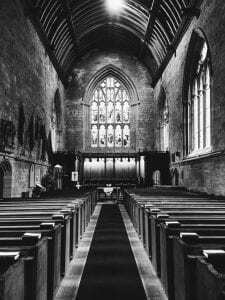 The 16th century Cathedral is another a great site to visit, as it is also within walking distance of the hostel. If you are a keen walker, then you will be spoiled for choice in this area – there are a range of walks, all with different levels of difficulty. The Hermitage, which is within walking range of the hostel is a great place to start, with paths leading up by the river to Ossians Hall and beyond. If you take the 20 minute drive out to Pitlochry, you’ll be able to walk up the Hydro-electric dam and salmon ladder, which is fascinating as much as it is daunting (if you’re scared of heights). 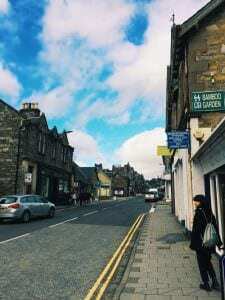 If you travel to Pitlochry, you’ll experience yet another charming Scottish town, with some of the most picturesque views in the country very near by. Queen’s View, part of the Tay Forest Park, sports one of the best, easily accessible views in Scotland. Looking up Loch Tummel and onto the Glencoe Mountain Range, it is clear to see why Queen Victoria visited here in the 1900’s. Dunkeld, Birnam and the surrounding area – a wonderful part of Scotland to visit, with plenty to do whether it is rain or shine. JESSIE MACS is the perfect hostel to use as your base for exploring this area and you’re certain to be greeted with a warm and friendly welcome. Dunkeld Cathedral and Pitlochry Near Dunkeld © Haydn Park-Patterson, all rights reserved. The Hermitage near Dunkeld ©VisitScotland / Kenny Lam, all rights reserved. Cycling near Dunkeld ©VisitScotland / Paul Tomkins, all rights reserved.